When David Livingstone, the Missionary pioneer to Africa received a letter stating... "We would like to send other men to you. Have you found a good road yet?" Livingstone replied... "If you have men who will only come IF they knew there is a good road, I don’t want them. I want men who will come if there is NO road at all!" King David – Sheppard, Warrior and King of Israel (Hebrew meaning of his name is "beloved") 1 Samuel 16 – 1 Kings 2… Multiple times in the Bible David is recognized as a man after God’s own heart and was sensitive to the leadership of God in his life. We first learn about who David would become, when God rejected Saul’s reign, and said that He would give the kingdom to a neighbour of Saul’s, who was a better man (I Samuel 15). At the time God said this to Saul through Samuel, David was only a boy of 8 to 12 years old. God knew that though David was young, he would grow up to be a man in tune with God’s heart and plan for Israel. David was victorious because he trusted in God for the victory, not himself. He killed many of Israel’s enemies in battle. Despite several opportunities, David refused to kill King Saul, God’s first anointed king, who was pursuing him out of mad jealousy. David became friends, like brothers, with Saul’s son Jonathan, setting a model of friendship that everyone can learn from. David wrote many of the Psalms that we all cherish. This was not because David never had problems because he wrote many of those precious poems in the midst of trouble. Yet, David knew that his strength came from God. We enjoy his writings today because he was a man who knew how to lean on the Lord during times of adversity. What he wrote in Psalms about trusting the Lord is applicable to us today. We also read about David in Matthew 1:1, 6, 22, 43-45; Luke 1:32, Acts 13:22, Romans 1:3 and Hebrews 11:32. Down through the ages whenever God has done a significant work, He has done it through a band of committed people… God doesn’t work through the lukewarm but only through those who are fervent in their love for Christ and His Kingdom! This was the case when David’s kingdom was established. Through David’s reign the Lord God of Israel was known by all… But, great as David was he did not stand alone. He surrounded himself with mighty Men who accomplished great feats of valour. They risked their lives because they were committed to God and they were committed to David and his kingdom. David’s mighty men realized that David’s kingdom was the centre for God’s Kingdom on earth (2 Samuel 7:16). 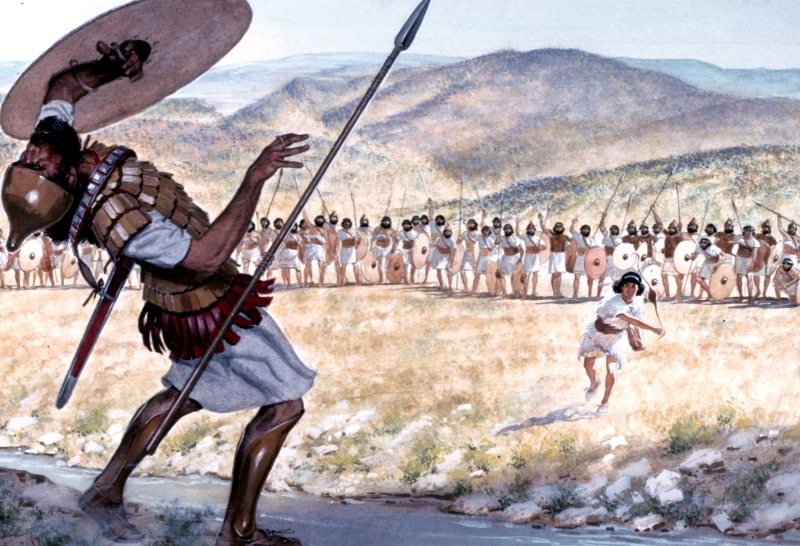 David’s Mighty Warriors (also known as David’s Mighty Men or the Gibborim) 2 Samuel 23:8-39; 1 Chronicles 11:10-47… Three of the mighty men that stood out from all the others: Jashobeam; was the chief of the captains who killed 800 at once with his spear. Eleazar; fought alone with David until his hand clung to his sword. Shammah; After the Israelites had fled, he stood alone and single handily defeated the entire Philistine troop of 300-800 men over a plot of lentils. Abishai; Commander and most honoured of the thirty whose brother was Joab, one of David’s Captains. He killed 300 men and the son of a giant. Benaiah; the Captain of David’s guard, killed two Moabite heroes, an Egyptian giant, and a lion …and also helped Solomon secure the throne after David died. Uriah the Hittite; was a very loyal soldier that had a beautiful wife named Bathsheba… but David wanted her for himself and put him in a part of the battle where he couldn’t survive. They were men who supported David, military and politically and their loyalty and impressive combat feats gained them honour in David’s kingdom, but more than that they worked with David a man chosen by God, to rule His nation of Israel. They knew God had instituted authority and were obedient to the submission of Godly authority. Adam: Meaning of his name in Hebrew; “human” or “a man.” (Interestingly the word “dam” in Hebrew means blood. Adam is from the word – “Adamah” “earth” or “ground” …so it could actually read: God made Adam from the earth and put blood in him) Genesis 1:26-5:5; 1 Chronicles 1:1; Luke 3:38; Romans 5:14; 1 Corinthians 15:22, 45; 1 Timothy 2:13-14.… Adam was created personally by Yahweh – God and was the first man on earth, and for a short time he lived alone and had no childhood, no parents, no family and no friends. Perhaps Adam’s loneliness moved God to quickly present him with a companion, Eve. Before God created Eve, he had given Adam the Garden of Eden and was his to enjoy, but he also had the full responsibility of taking care of it (Genesis 1:26-27). Adam would have taught Eve the rules of the garden. Even though she knew it was forbidden to eat the fruit from the tree in the middle of the garden, when Satan tempted her, Eve was deceived. When she offered the fruit to Adam, the fate of the world was on his shoulders. As they ate the fruit in that one act of rebellion, man’s independence and disobedience separated him from God. But, God already had a plan in place to deal with man’s sin. The Bible is the story of God’s plan for man. Adam is “our” beginning, and we are all his descendants. Moses - was an early leader of the Israelites is said to have talked with God. (Hebrew meaning to his name “to pull or draw out of water”) His story is told in the Bible in the book of Exodus and to whom God gave the law, the 10 Commandments… In Moses’ life we remember events showing a godly man and other stories that show a man that struggled with failure in certain areas of his life. Even though he sometimes failed, Moses was a man consistently in tune with God’s plan and he loved the people of Israel who God called him to lead. As a child Moses grew up protected in the Egyptian Pharaoh’s house even though he was born to a Jewish family. Moses learned from the best Egyptian teachers and scholars. He probably did not learn much about the God of Israel through his tutors …yet he grew up sensitive to God’s leading. Moses claimed to not be a great speaker yet he was able to lead the Israelites for 40 years out of Egypt, through the Red Sea, and to the edge of the Promised Land. Moses disappointed God with some of his actions but repented of his lack of trust and was used greatly by God to accomplish His purposes. Enoch (Hebrew meaning of his name “Dedicated or Teaching”) - we find his story in Genesis 5… In a long list of the descendants of Adam, Enoch holds a rare distinction in the Bible …he did not die! Instead, God “took him away.” Scripture does not reveal much about this remarkable man... Only a short sentence; “Enoch walked faithfully with God,” in Genesis 5:22 and repeated again in Genesis 5:24 revealing why he was so special to God his Creator. In this wicked period before the Flood, most men did not walk faithfully with God! They walked their own path, the crooked way of sin. Enoch did not keep silent about the sin around him. Jude says Enoch prophesied about those evil people and could be a word for our day too; “See, the Lord is coming with thousands upon thousands of his holy ones to judge everyone, and to convict all of them of all the ungodly acts they have committed in their ungodliness, and of all the defiant words ungodly sinners have spoken against him,” Jude 1:14-15. Enoch walked in faith, the 365 years of his life, and that made all the difference. No matter what happened …he trusted God …he obeyed God. God loved Enoch so much he spared him the experience of death (Genesis 5:24). Enoch was listed in Hebrews 11 the “great Hall of Faith”… (Hebrews 11:5-6). Only one other person in Scripture was honoured this way: the prophet Elijah. 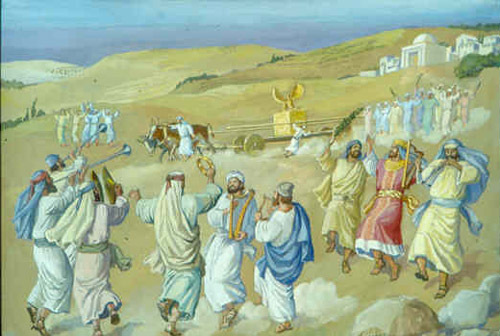 God took that faithful servant to heaven in a whirlwind in chariots of fire (2 Kings 2:11). Enoch’s great-grandson, Noah, also “walked faithfully with God, Genesis 6:9. Because of his righteousness, ONLY Noah and his family were spared in the Great Flood. Noah – (Hebrew name means "Comfort or Rest") Genesis 6 – Noah was a Righteous Man in a world taken over by evil, violence and corruption. However, Noah wasn’t just a righteous man; he was the only follower of God left on the earth… The Bible says he was blameless among the people of his time. This does not mean Noah was perfect or sinless. Noah loved God with his whole heart …and was fully committed to obedience. Noah’s life revealed patience and persistence …and his faithfulness to God did not depend on anyone else. The Bible also says he walked with God. Living in a society saturated with sin and rebellion against God …Noah was the only man alive that pleased God! It’s hard to imagine such unwavering faithfulness in the midst of such godlessness. Over and over again, in the account of Noah's life we read, "Noah did everything just as God commanded." His life of 950 years was an example of obedience. "And Noah fathered three sons, Shem, Ham, and Japheth," Genesis 6:10. Since the wickedness of man had covered the earth like a flood, God decided to start over again, with Noah and his family …and gave him very specific instructions how to build an ark, in preparation for a catastrophic flood that would destroy every living thing on earth. The ark-building project took longer than the average lifespan today, yet Noah diligently accepted his calling and must have endured many people scoffing at the building of the Ark …but he never wavered from it. Noah is also mentioned in the Hebrews 11 …"Hall of Faith." 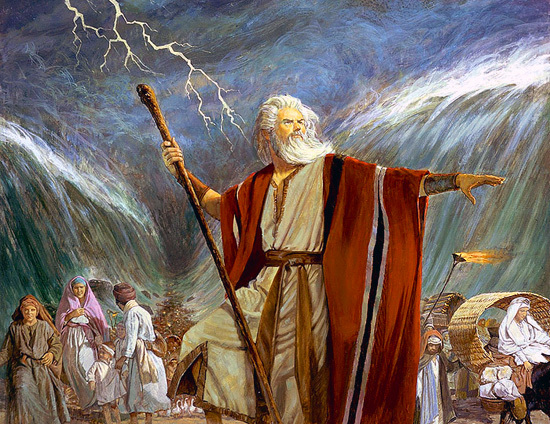 Noah was truly a hero of the Christian faith. Noah’s sons: Shem, Ham and Japheth sons after the Flood… "These are the families of the sons of Noah, after their generations, in their nations. And from these were the nations divided in the earth after the flood," Genesis 10:32. Shem: his name means "fame" or "name." He was blessed by his father Noah. Shem fathered the Semitic people, the Jews. Scholars call the language they developed Shemitic or Semitic. Shem lived 600 years and his sons included; Arpachshad, Elam, Asshur, Lud, and Aram. Japheth: his name means, "may he have space." He was blessed by Noah (along with Shem). He fathered seven sons; Gomer, Magog, Madai, Javan, Tubal, Meshech, and Tiras and their descendants spread to the coastlands around the Mediterranean and lived in harmony with Shem’s people. Ham: his name means "hot" or "sunburnt." His sons were Cush, Egypt, Put, and Canaan. One of Ham’s grandsons was Nimrod, a mighty hunter, king over Babel. Nimrod also built the ancient city of Nineveh which later played a part in the story of Jonah the prophet. It was Ham that un-covered his father’s nakedness in Genesis 9:22 and was cursed. We read again about the grandsons of Noah, in Ezekiel 38 - the War of Gog and Magog. The nations are where Noah’s grandchildren were decedents and will be the people in those areas today that will come against Israel. Methuselah… has fascinated Bible readers for centuries as the oldest man who ever lived Genesis 5:21-27; 1 Chronicles 1:3; Luke 3:37. Three possible meanings have been suggested for his name… “man of the spear (or dart),” “his death shall bring...,” and “worshiper of Selah” The second meaning may imply that when Methuselah died, judgment would come, in the form of the Flood. Methuselah was 969 years old when he died Genesis 5:27. 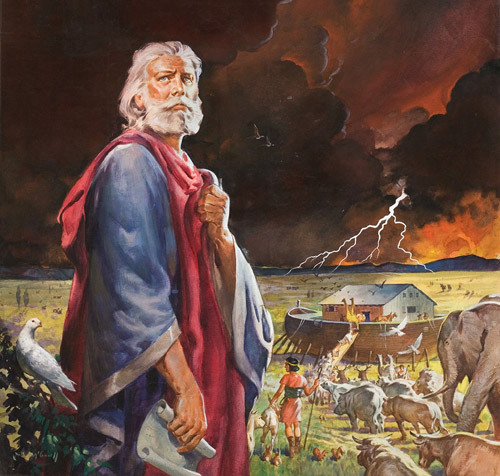 Methuselah was a descendant of Seth, the third son of Adam and Eve …and his father was Enoch, his son was Lamech, and his grandson was Noah, who built the ark and rescued his family from the great Flood. The Bible does not indicate that Methuselah’s character had anything to do with his long life but he certainly would have been influenced by the example of his righteous father Enoch, who pleased God so much he escaped death by being “taken up” to heaven. Abraham: (His name in Hebrew means “father of a multitude”) originally called Abram, or “exalted father,” the Lord changed his name to Abraham as a symbol of the covenant promise to multiply his descendants into a great nation that God would call His own… Genesis 11-25; Exodus 2:24; Acts 7:2-8; Romans 4; Galatians 3; Hebrews 2, 6, 7, 11. Prior to this, God had already visited Abraham when he was 75, promising to bless him and make his offspring into an abundant nation of people. All Abraham had to do was obey God and do what God told him to do. 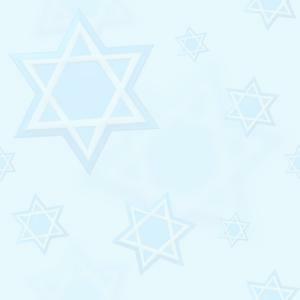 Abraham, the founding father of the Jewish nation of Israel, was a man of great faith and obedience to the will of God. This marked the beginning of the covenant God established with Abraham. It was also Abraham’s first test from God, since he and his wife Sarai (later changed to Sarah) were still childless. Abraham demonstrated remarkable faith and trust, immediately leaving his home and his clan the moment God called him from Ur, to the unknown territory of Canaan. 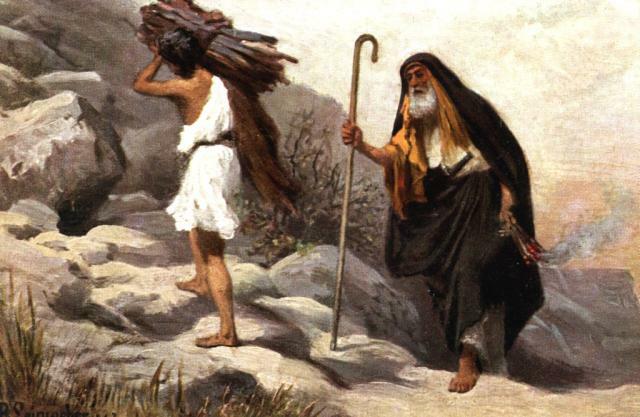 Accompanied by his wife, Sarah, and nephew Lot, Abraham prospered as a rancher and shepherd, as he made his new home, surrounded by pagans, in the Promised Land of Canaan. More years passed, and still childless, Abraham and Sarah questioned God’s promise …and so with Sarah’s encouragement, Abraham slept with Hagar, his wife's Egyptian maidservant. Hagar gave birth to Ishmael, but he was NOT the promised son. God returned to Abraham when he was 99 to remind him of the promise and reinforce His covenant with Abraham. A year later, Isaac the child of God’s promise was born. But Abraham underwent the biggest testing of his faith when God asked him to sacrifice Isaac (Genesis 22). This time Abraham completely obeyed God, prepared to slay his son, whilst fully trusting God to either resurrect Isaac from the dead (Hebrews 11:17-19). The death of Isaac would have contradicted every promise God had made to Abraham, so his willingness to perform the ultimate sacrifice of killing his son is probably the most strikingly dramatic example of faith and trust in God found in the entire Bible. Abraham is the great patriarch of Israel, and to Christians (Romans 4:16). Melchizedek (Hebrew meaning of his name “king of righteousness” and his title “king of Salem” also means “king of peace” and we see this in the Hebrew word “Shalom.” He lived in “Salem,” in Canaan, which later became “Jerusalem” Genesis 14:18-20; Psalm 110:4; Hebrews 5:6, 10, 6:20, 7:1-17… Melchizedek was one of those puzzling people in the Bible who appear only briefly …but mentioned again as examples of holiness and right living. The startling fact about Melchizedek is that although he was not a Jew, he worshipped God Most High, the one true God of Israel. 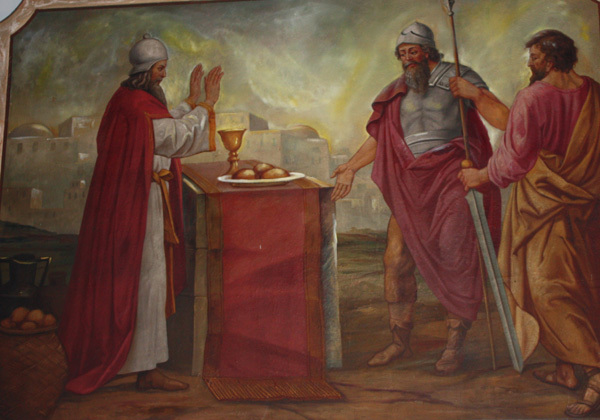 Melchizedek blessed Abram, (later to be renamed Abraham), after Abram rescued his nephew, Lot, from enemy captivity …and brought back other people and goods. He recognized Abram as a follower of the true God and blessed him. Melchizedek lived a holy and righteous life. Abram honoured Melchizedek by giving him one tenth of the plunder of battle, or a tithe. Melchizedek’s graciousness is contrasted with the rudeness of the King of Sodom. God revealed Himself to Abraham …but we don’t know how Melchizedek learned of the true God. Monotheism, or worship of one god, was rare in the ancient world. Most of the people worshiped several gods and/or household gods, which were represented by man-made idols. Understanding Yeshua (Jesus) status as our High Priest is a key point in the Book of Hebrews. Just as Melchizedek was not born into the Levitical priesthood …but was appointed by God, so Yeshua (Jesus) was named our Eternal High Priest, interceding with God the Father on our behalf (Hebrews 5:8-10). Job (Hebrew meaning of his name “persecuted one”) – the book of Job… Satan was talking with God one day when he said that no one completely obeyed God and worshiped Him… God said that He knew of a man who was just and upright in his life …his man was Job! God gave Satan rule over Job’s circumstances causing him to lose all of his wealth and even in his dire circumstances Job still would NOT speak evil against God. He even acknowledged that God was the one who was testing him and that he would continue to worship the Lord. Job’s friends accused him of sin and said he was being punished by God for his secret sins. Job maintained his innocence. Even his wife told him he should curse God and die, but Job patiently waited on God to reveal Himself and publicly justify Job to the world, and God did! Daniel (Hebrew meaning of his name “God is my judge”) – the book of Daniel… Though he grew up a slave in Babylon, Daniel was eventually promoted to a position of authority under the reign of King Nebuchadnezzar. It was through the influence of Daniel that the kingdom was able to see some godliness brought to that godless time. Later, King Darius befriended Daniel; however, there were men who were jealous of Daniel’s influence and position. They convinced the king to make a law that the people could only worship the king …and NO other person NOR God. Daniel continued to pray as he always had done to the God of Israel. The punishment for disobedience of the law not to worship was to be thrown into a pit of lions …and these wicked men had Daniel arrested. Daniel accepted the punishment that was given to him without complaint. King Darius fought the law on Daniel’s behalf, but was powerless to change the consequences. 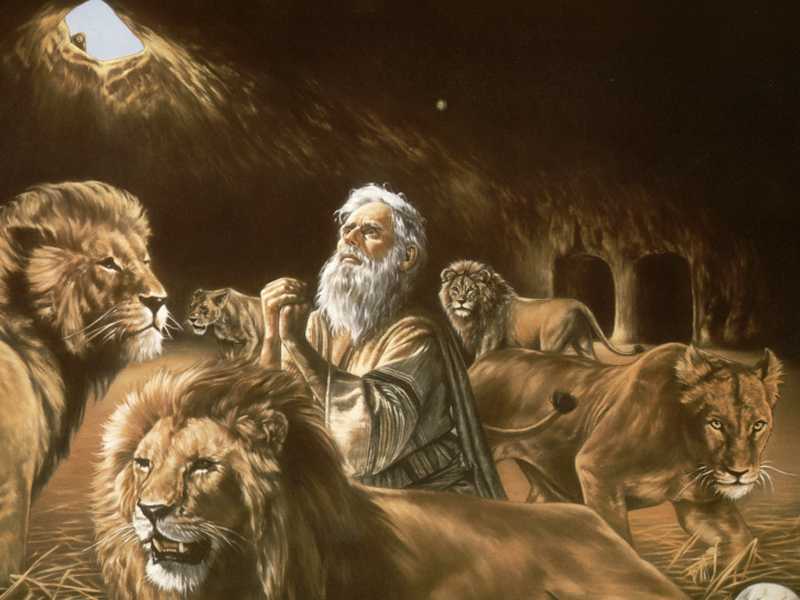 While Daniel slept peacefully in the den of lions, Darius was up all night worrying about this man of God. The next morning the king was relieved to have Daniel brought out of the pit and the men who plotted against Daniel were then fed to the lions instead. In Daniel 6 we read that their bodies never even reached the ground before the lions had devoured them. Joshua (Hebrew Meaning; “the Lord is Salvation”) Exodus 17, 24, 32, 33; Numbers, Deuteronomy, Joshua, Judges 1:1-2:23; 1 Samuel 6:14-18; 1 Chronicles 7:27; Nehemiah 8:17; Acts 7:45; Hebrews 4:7-9… When Moses led Israel out of Egypt one of the young men who quickly rose to recognition was Joshua! Joshua was chosen as one of the 12 spies to enter the land that God had promised to Israel. 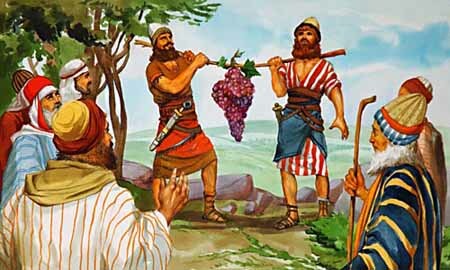 Though the vast majority of the spies returned with a discouraging report of the land God said He would give them, Joshua and Caleb reported all the wonderful things that God could provide them in Canaan because Joshua trusted God. He recognized the authority Moses and his position of leadership that God gave him. Joshua NEVER tried to usurp the authority of Moses. He waited until it was his time to lead Israel into the Promised Land. Joshua was an obedient follower and he was also known as a strong leader of Israel as they conquered the land that God had given to them. Joshua represented the tribe of Judah, from which came Yeshua (Jesus), the Saviour of the world. Caleb - Hebrew name means “dog (kelev)” or (Keleb) “bold” or “famous bearer” or ((kal / kol) “whole – all of” and (lev) “Heart”) “whole heart” Numbers 13, 14; Joshua 14, 15; Judges 1:12-20; 1 Samuel 30:14; 1 Chronicles 2:9, 18, 24, 42, 50, 4:15, 6:56… Caleb was a man who lived as most of us would like to live …putting his faith in God to handle the dangers around him. His story appears in the book of Numbers, after the Israelites had escaped Egypt and arrived at the border of the Promised Land. Moses sent 12 spies into Canaan to scout the territory. Among them were Joshua and Caleb. All the spies agreed on the richness of the land, but ten of them said Israel could not be able to conquer it because its inhabitants were too powerful and their cities were like fortresses. Only Caleb and Joshua dared to contradict them (Numbers 13:30). God was so angry at the Israelites for their lack of faith in Him that He forced them to wander in the desert for 40 years, until that entire generation had died …all except Joshua and Caleb! After the Israelites returned and set about conquering the land, Joshua, the new leader, gave Caleb the territory around Hebron, belonging to the Anakites. These giants, descendants of the Nephilim, had terrified the original spies but proved no match for God’s people. Yeshua (Jesus): Jesus of Nazareth; the Christ - The “Anointed One” and the “Messiah.” The name “Hebrew-Aramaic word “Yeshua,” meaning “Yahweh (the Lord) is Salvation” ….His heavenly Father was God the Father, His earthly Father was Joseph, His Mother was Mary and brothers James, Joseph, Judas (not Iscariot) and Simon (Mark 3:31 and 6:3; Matthew 12:46; 13:55; Luke 8:19) …Sisters were not named but mentioned in Matthew 13:55-56 and Mark 6:3. The Genealogy of Yeshua (Jesus) is recorded in Matthew 1:1-17; Luke 3:23-37… The name “Christ” is actually a title for Jesus and comes from the Greek word “Christos,” meaning “the Anointed One,” or “Messiah” in Hebrew. His life, message and ministry are chronicled in the four Gospels of the New Testament; Matthew, Mark, Luke and John. 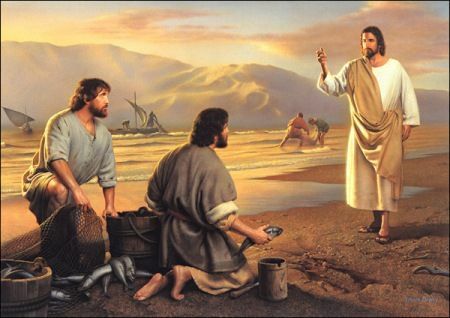 Yeshua was a Rabbi (Jewish teacher) from Galilee who performed many miracles of healing and deliverance. 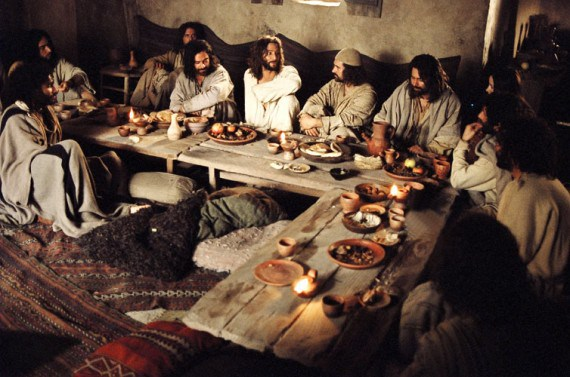 His Disciples were twelve Jewish men who followed Him and He worked closely with them to train and prepare them to carry on His earthy ministry. Yeshua was crucified in Jerusalem by order of Pontius Pilate, the Roman governor, for claiming to be the “King of the Jews.” He was resurrected three days after His death, appeared to His disciples, and then ascended into heaven. His life and death provided the atoning sacrifice for the sins of the world…. Man was separated from God through Adam’s sin, but reconciled back to God through Yeshua (Jesus) sacrifice on the Cross. Yeshua (Jesus) will claim His bride, the church, and later return at His Second Coming to judge the world and establish His Eternal Kingdom, thus fulfilling Messianic prophecy (Isaiah 53; 61). Apostle Paul (his name means “small or little” but his Hebrew name - Saul means “prayed for” or “asked for”) Acts 7:58-60 and books of the New Testament… Paul was a great man of the New Testament. We first see this man when his name was Saul of Tarsus. Before his salvation he persecuted the Christians. However Yeshua (Jesus) revealed Himself to Saul and he accepted the Lord as his personal saviour. Instead of persecuting the church, Saul changed his name to Paul and began to preach and establish new churches throughout the known world. Paul is most well-known for his three missionary journeys spanning from the Middle East as far west as Italy. He established many churches, trained young church leaders (pastors) and wrote much of the New Testament. The Apostle Paul is truly one of the great men of the Bible!